Icebergs and glaciers and plentiful wildlife, this is a voyage of non-stop highlights. Exploring landscape not only by ship but also on foot and via Zodiac. Roaming polar bears, lounging seals, grazing reindeer, and colonies of birds all co-exist. The island has an Arctic climate, although with significantly higher temperatures than other places at the same latitude. The flora benefits from the long period of midnight sun, which compensates for the polar night. Svalbard is a breeding ground for many seabirds, and also supports polar bears, reindeer and marine mammals. Six national parks protect the largely untouched, yet fragile environment. The island has many glaciers, mountains and fjords. Please note: While it is our intention of adhering to the route described above , there is a certain amount of flexibility built into the itinerary and on occasion it may be necessary, or desirable to make alterations. On the first day of your tour, your Expedition Leader will give you an expedition overview. The electricity onboard is 220AC electrical outlets, with European 2 pin round holes, as well as 110-volt shaving sockets in the bathroom for electric razors only. You may wish to bring an international adapter. A limited supply of hair dryers and electrical adapters are available to borrow free of charge at the Purser’s Desk. A carefully chosen team will lead our voyage. Our expedition ship boasts an international team of professional naturalists and lecturers. Their goal is to provide an informed and balanced interpretation of the destination, accomplished through stimulating lectures, day-to-day briefings, and informal discussions. Your lecturers and Expedition Leader will cover all aspects of the voyage including ornithology, marine biology, geography, geology, history and the environment, as well as practical things like photography. The Expedition Staff work conscientiously with you on deck and in the field, improving your observational skills to allow you to experience all that the destination has to offer. Their strong sense of ethics and ecological knowledge make for stimulating and mindful conversation whether onshore or at the dinner table. The expedition staff will pilot the Zodiac landing craft used for shore landings and Zodiac cruises; they are experienced drivers who operate the Zodiacs in a responsible manner. Onboard our expedition ship you’ll find a diversity of gourmet international cuisines prepared and catered by professional chefs; all meals are included in the price of your expedition. Dining is casual, tables are unassigned and the dining room is capable of seating the entire passenger compliment at one time. There is always a selection of different meals available, and vegetarians will find plenty of options. Special dietary requirements can be accommodated with advance notice, please advise us at time of confirmation. Coffee, tea and water are all provided free of charge. All other beverages, alcoholic and non-alcoholic are not included and can be purchased in the dining room, pub, or in the lounge. Your local flights from Oslo to Longyearbyen are not included in this tour. We recommend arriving at least 1 day prior to the sailing of the ship to guarantee your arrival. While flight delays are not common sometimes they do happen. Aboard the G Expedition in quad-, triple-, twin-share cabins, or suites (all with en suite bathrooms and porthole or window) (10 nts). Please note that all cabins consist of twin-size berths and are ocean-facing. Suites have one queen-size bed. Upon arrival into Longyearbyen airport please collect your luggage and look for a G Expedition representative who will direct you to the bus. 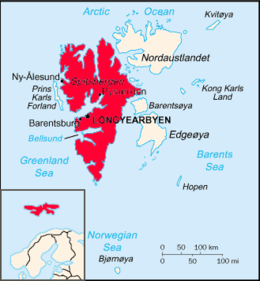 Please make sure you have advised your booking agent of your arrival flight details into Longyearbyen so we are expecting you. Be sure to keep all your important documents (i.e. passport) and medication in your hand luggage, as your main luggage will be transferred separately to the ship or hotel. Pre-night booked through G: Please use your provided tour voucher to hop onto the Flybuss shuttle service that will make its way to your accommodation. The most cost effective way to travel from the airport to the city is by local bus that services all Longyearbyen hotels at a price of approximately 50 NOK. If you would like to take a taxi, they are available at the airport or by calling one of two taxi companies at either +47 7902 1305 or +47 7902 1375. On Day 1 of the tour, there will be a baggage drop available for all passengers who are already in Longyearbyen. Please make sure you drop your checked luggage off at the meeting point between 9:00 am – 12:00 pm. A local representative will be in the luggage storage room. They can provide general information about the town or your embarkation process. All passengers will be transferred to the ship as a group for embarkation at 4:00 pm. Please ensure that for embarkation you have your passport accessible (not in your luggage which is being transferred separately to the ship). For those passengers arriving on Day 1, on a flight which lands after midday, please note that bags will be transferred with you to the ship at 4.00 pm. 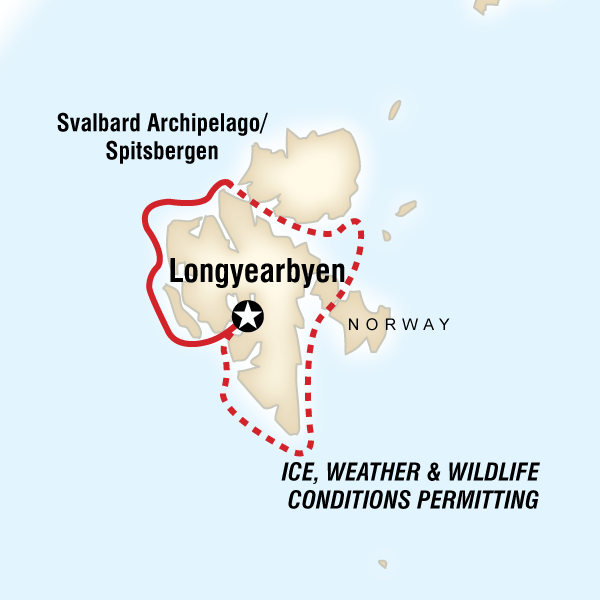 If for some reason you cannot arrive at the meeting point, please make your own way to the Port of Longyearbyen no earlier or later than 4:00 pm. Embarkation time is set for 4:00 pm and passengers will not be able to board the ship before that time due to refuelling, provisioning, and preparing the ship for your stay. On embarkation day, you may have to board the ship via Zodiac. You should bring clothing suitable for cold and wet conditions. Waterproof pants are recommended. Once aboard, you will find your luggage stored in your assigned cabin, please ensure that all your luggage is accounted for on arrival. On departure day, we will offer transfers to Longyearbyen Airport for all passengers with flights scheduled on that day. For those passengers disembarking at our regular time of 8:00am, you will be transferred to either the airport or the Radisson Blu Polar hotel, depending on the time of your flight. Those transferred to the hotel will have an opportunity to explore the town center on their own, and then be transferred to the airport later in the day as per flight schedules. Transfer times will be confirmed, and communicated onboard prior to departure. Luggage storage at the Raddison Blu Polar hotel will be available until time of departure. Most airlines allow one checked bag and two carry-on per person. To avoid any problems on check-in and with possible excess baggage charges, please consult the airline for specific restrictions. Circumpolar North / Greenland Map • ITMB • With the North Circumpolar region on one side, including Iceland, and a detailed map of Greenland on the other. Aboard the G Expedition, laundry facilities are provided at a nominal charge. Accompanying the voyage is our dedicated and experienced staff of expedition leaders, naturalists and lecturers who share with us their knowledge, enthusiasm and commitment to the environment. Our ship is manned by officers and crew, all highly experienced in ice navigation. A carefully chosen team will lead our voyage. They are chosen not only for their local knowledge and wealth of experience but also for their great love of the polar regions. With formal lectures, as well as informal briefings and discussions, your lecturers and Expedition Leader will cover all aspects of the voyage including ornithology, marine biology, geography, geology, history and the environment, as well as practical things like photography. Credit cards and debit cards are very useful for cash advances. Visa cards are the most widely accepted cards. While ATMs are widely available, there are no guarantees that your credit or debit cards will actually work in Norway. Check with your bank. You should be aware that to purchase products or services on a credit card a fee of 5%-10% usually applies. Do not rely on credit or debit cards as your only source of money. A combination of US dollars cash and credit cards is best. Always take more rather than less, as you don’t want to spoil the trip by constantly feeling short of funds. While on board our Expedition ships, USD cash and Visa, MasterCard, and American Express, are accepted to clear incidental bills at the end of the cruise by the ship’s Purser (ie. bar bills, laundry etc.). Usually included in international air ticket that you have purchased. Get a first glimpse of the midnight sun in Longyearbyen, Spitsbergen’s capital. Transfer from the city to the G Expedition for a late afternoon embarkation. Please make sure you drop your checked luggage off at the meeting point between 9am – 12pm. A local representative will be in the luggage storage room. They can provide general information about the town or the embarkation process. Transfer by local bus from the meeting point in the city to the port. Each day is planned to take advantage of local ice and weather conditions. Svalbard is one of the few places on the planet to offer such a plethora of natural and historical extravaganzas. Spend the next nine days exploring the remote polar regions. Visit ice-sculpted fjords with breathtaking mountain scenery, and glaciers crashing into the sea. Spend time exploring pack ice edges in search of polar bears hunting seals. At one or more of the stops, it’s possible to encounter Svalbard’s arctic fox and the region’s unique reindeer. Our goal is to give travelers the best possible opportunity to see wildlife in and around the Svalbard archipelago. Ice conditions sometimes allow for sailing through the Hinlopenstretet towards the east coast of Spitsbergen, then through Freemansundet towards the south. However, this is not always possible. Svalbard is one of the few places on the planet that offers such a wealth and diversity of natural and cultural history sites. During these nine days, visit ice covered seas, fjords with breathtaking mountain scenery, and glaciers flowing into the sea. Spend time moving through the ice in search of polar bears hunting seals. Ivory gulls will be a highlight for the birders. Keep a constant lookout for walrus hauled out on ice floes or on sandy beaches. Ice permitting, visit spectacular bird cliffs filled with thousands of murres (guillemots), as well as kittiwakes and glaucous gulls. Shore stops will be highlighted with tiny tundra flowers. The Expedition team will be on hand to answer any questions about this spectacular wilderness. On board our expedition ship you’ll find a diversity of gourmet international cuisines prepared and catered by professional chefs; all meals are included in the price of your expedition. Dining is casual, tables are unassigned and the dining room is capable of seating the entire passenger compliment at one time. There is always a selection of different meals available, and vegetarians will find plenty of options. Special dietary requirements can be accommodated with advance notice, please advise us at time of confirmation. Coffee, tea and water are all provided free of charge. All other beverages, alcoholic and non-alcoholic are not included and can be purchased in the dining room, pub, or in the lounge. Allow USD25-35 for meals not included. Kayaking isn’t just an outdoor adventure, it’s an opportunity to experience these remote regions from another vantage point. A limited number of lucky adventurers will venture out to sheltered bays and areas known for calmer waters and take part in group kayaking trips led by our experienced and skilled leaders. No other activity gets you as close to the natural environment!